Last year I did a One Little Word Class at the Sparkle N Sprinkle shoppe and we made an Altered Book with the monthly prompts. 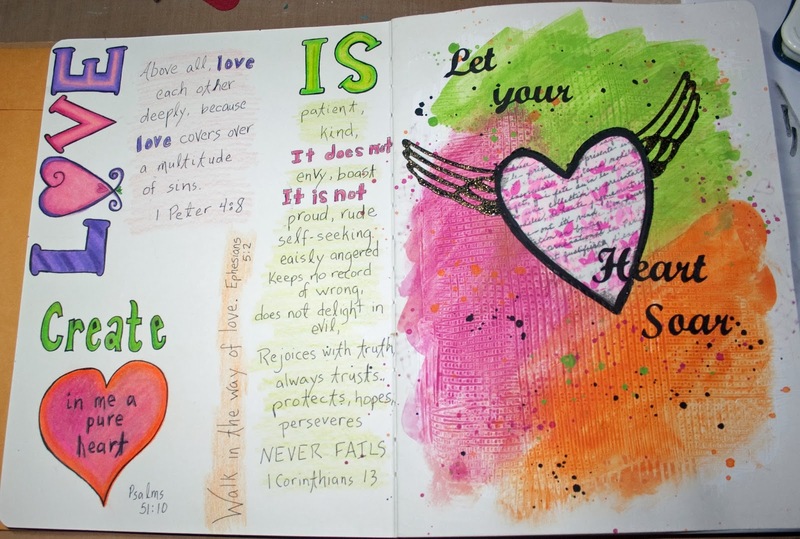 This year I am doing a monthly Mixed Media class creating a journal, we are using the Dylusions Large Journal. I am still incorporating One Little Word, but that will not be the complete focus throughout the year. If you are new to what One Little Word is you can read about it here. I am also using the Journal 52 for weekly prompts for the journal and hope to complete a page each week. For the first week the prompt was Up, Up and Away, my One Little Word for this year is Love, so I made my heart flying up, up and away. I taught the right hand side of the page for my class and we used Gesso and a piece of plastic canvas to create the texture. Then with acrylic paints we added the color. The second week is A Simple Place. My simple place is at home with my family. For the background of the right side I used one of the papers I made with my new Gelly Printing Plate (love it!) Then I added scraps around it, toned it down with some Gesso and stamped the flowers. I had a fabric flower I had just made on my desk and the colors matched so I added that. 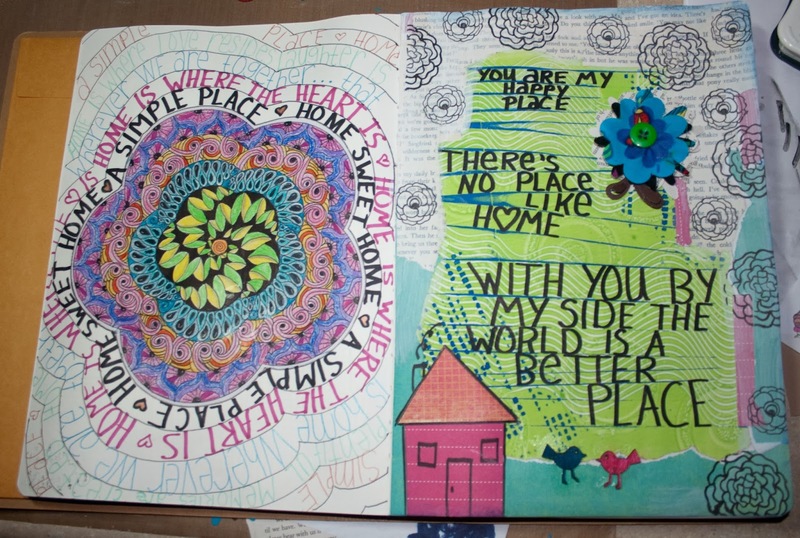 I also had the Zentangled medallion I had just finished so it was used for some added journaling on the left page. Now I'm getting ready to do my cover for my journal and the 3rd week! Loving the creativity!